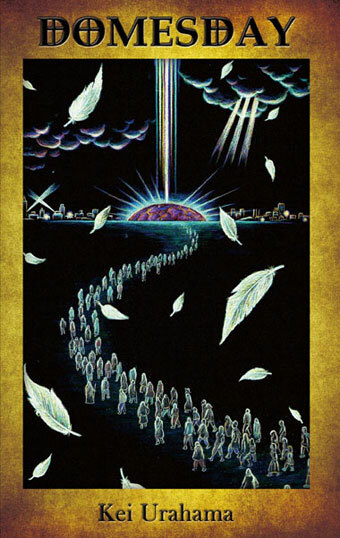 Just wanted to plug this new book called “Domesday” by a Japanese author named Kei Urahama. It was actually written in the apocalyptic-ly auspicious year of 2000 but is released as an English version during another Mayan-ly auspicious year of 2012. It is just as relevant this year as it was over a decade ago. I was fortunate to meet the author, Kei Urahama, while assisting on the translation of a script he was working on with Shion Sono several years ago. Although that film project was looking very promising at first, receiving awards at the Pusan project market, it hasn’t moved forward since then. Luckily this novel, Domesday, has progressed to the international stage. I was honored to be able to be involved even in a small way in preparing this book to be published outside Japan. It won a very illustrious Japanese award called the Komatsu Sakyo award that is the Japanese equivalent of the Nebula or Hugo awards. I never gave much thought to Japanese science fiction – most of us have been avid J-horror fans or anime fans over the years, and although there are often elements of sci-fi in Japanese anime and manga, for the most part we don’t pay much attention to their sci-fi novels. As you might imagine though, there is a long, rich tradition of sci-fi literature in Japan. Domesday is definitely a book worthy of note since it stands out even among its peers in J-Sci-Fi. Why does it stand out? First and foremost, it incorporates many elements that both Eastern and Western sci-fi often avoid. There is a major character who is a religionist and hence directly refers to and quotes from the Bible. Those who’ve had the good fortune to read the book are commenting that it has a lot of relevance to current events and trends in America. We are often astounded at how authors of ‘speculative fiction’ can predict the future. Well I’d say Kei Urahama was prescient of future events and trends by about a decade. I’m definitely not one to talk about the plot and ruin it for you though. Check this book out and see what I mean. Although… should I say it? Yes, there are ZOMBIES – but these zombies don’t follow any of the cliches that I’ve ever come across. This horror element to the novel will definitely keep you on your toes as even the characters compare and contrast the zombies from their own personal hell to those from the classic films and video games. Self-reflexive zombies? What next? It’s available on Amazon.com in either eBook or Paperback form.